Nice breakfast. Clean and lovely quiet away from the hustle and bustle of the city. Friendly hosts and who needs Santorini sunset with the crowds when you get to sit on your balcony and watch the same sunset without any of the crowds. And the sunset is completely over the water. Brilliant. Very lovely place. Immaculately looked after. 5 mins to town in a car. 20 min walk to two beaches. The room was clean, the staff professional and friendly. Nice grounds and pool. Room clean and tidy. Great bathroom. Nice outdoor areas. The staff were so lovely, it had an amazing sunset view every night. The village was very nice, with two swimming pools (one of them for children), a snack bar also used for breakfast, and a very quiet atmosphere. The room (number 210) was big and quiet, had a comfortable bed, a large shower, and a wide balcony with a breathtaking view of the sea and of sunsets. The staff was very kind and available for any possible clarifications and information. Complimentary breakfast included at least coffee (more or less american style), cold milk, tea, fruit juices, marmalades, butter, bread, toasted sandwiches, sausages, bacon, ham, cheese, biscuits, and various cakes. Lock in a great price for Fragoulis Village – rated 8.6 by recent guests! Fragoulis Village is set in lush gardens on the west coast of Paros between the picturesque bays of Agia Irini and Parasporos. All rooms feature a balcony with sea or garden view and are equipped with TV, air condition and private bathroom. Fragoulis Village houses a swimming pool and a children's pool, a play ground and a snack-bar. Continental breakfast is served upon request. The complex features a stunning sea view. Surrounded by palm trees, the sandy beach of Agia Irini is a 20 minute walk away. When would you like to stay at Fragoulis Village? Offering garden views, this air-conditioned room includes a TV, mini fridge and private bathroom. This air-conditioned room includes a TV, mini fridge and private bathroom. Featuring twin or double bed, this apartment has a seating area and veranda overlooking the sea and the sunset. The kitchenette has very light cooking facilities. Η εξαιρετική τοποθεσία του καταλύματος μας σε συνδυασμό με το πάντα φιλόξενο και χαμογελαστό προσωπικό μας θα κάνουν τις διακοπές σας αξέχαστες και μοναδικές. Ο απέραντοι εξωτερικοί χώροι μας γεμάτοι λουλούδια και φυσικό γρασίδι αποτελούν ένα ασφαλές περιβάλλον για να παίζουν τα παιδιά ενώ εσείς απολαμβάνεται τον καφέ σας στην πισίνα ή στο μπαλκόνι του δωματίου σας. Η οικογενειακή ατμόσφαιρα και η αυθεντική φιλοξενία εξασφαλίζει στις οικογένειες το σπίτι μακριά από το σπίτι τους! Παράλληλα, η θέα που κόβει την ανάσα με το εκπληκτικό ηλιοβασίλεμα και το απέραντο μπλε της θάλασσας, δημιουργούν το ιδανικό περιβάλλον για ζευγάρια που αναζητούν μία ρομαντική και ήσυχη διαμονή στην Πάρο. Οι ποικιλίες των δωματίων μας, με πάντα όμορφη διακόσμηση, είναι σχεδιασμένα να πληρούν τις απαιτήσεις σας και για να σας προσφέρουν μία άνετη διαμονή. Ονομάζομαι Κατερίνα και θα χαρώ να σας καλωσορίσω στο κατάλυμα μας. Όλοι μαζί και ο καθένας χωριστά στο Fragoulis Village, προσπαθούμε καθημερινά να διατηρήσουμε όλα εκείνα τα στοιχεία που μας κάνουν ξεχωριστούς και μοναδικούς. Για αυτό τον λόγο μην διστάσεται να με αναζητήσετε και θα χαρώ να σας εξυπηρετήσω. Ανυπομονώ να σας γνωρίσω από κοντά! Βρισκόμαστε μόλις 3,5 χλμ απο την Παροικία και 1 χλμ απο τις παραλίες της Αγίας Ειρήνης και του Παρασπόρου. Τα εστιατόρια και οι ταβέρνες απέχουν με το αυτοκίνητο 10-15 λεπτά είτε στην Παροικία είτε στην Αλυκή. House Rules Fragoulis Village takes special requests – add in the next step! Fragoulis Village accepts these cards and reserves the right to temporarily hold an amount prior to arrival. Please inform Fragoulis Village of your expected arrival time in advance. You can use the Special Requests box when booking, or contact the property directly using the contact details in your confirmation. Pool towels, but no beach towels available. No in room tea and coffee. No laundry facilities. The final stairs to reach the room (number 210) were not very easy to climb, especially under intense sunlight and with luggage to carry. Also, the door lock was quite hard to engage (you had to push/pull the door hard to make it work), possibly due to heat from the sunlight. It was a little far to go to the beach. But very nice to just chill by the pool. 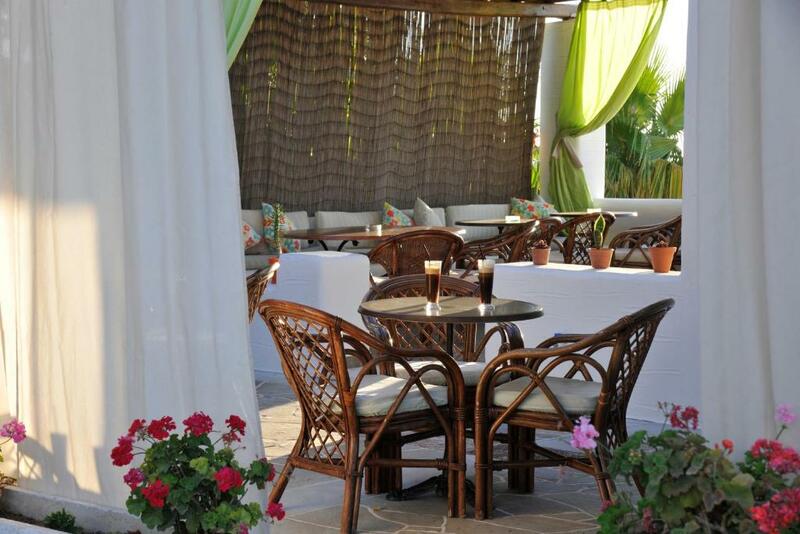 You are provided with towels and you can order drinks, snacks, sandwiches from the pool bar. The bed was a little hard. The shower was old and just a hand shower. Nice staff. Good breakfast. Scenic view of sunset over sea.